The AMORDEGRC function is one of the financial functions. It is used to calculate the depreciation of an asset for each accounting period using a degressive depreciation method. cost is the cost of the asset. 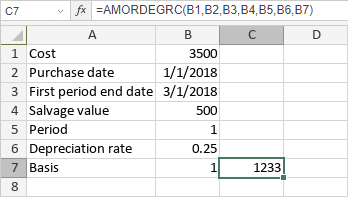 date-purchased is the date when asset is purchased. first-period is the date when the first period ends. salvage is the salvage value of the asset at the end of its lifetime. period is the period you wish to calculate depreciation for. rate is the rate of depreciation.